HIGHLIGHTING bankruptcy of leadership in the world leading to disorderly development, Dr Dnyaneshwar Mulay said, “The biggest challenge we face is to find out the correct way of orderly development. For this, our leaders, bureaucrats, policy makers and social reformers must be innovative in every possible way. They must find new ways. 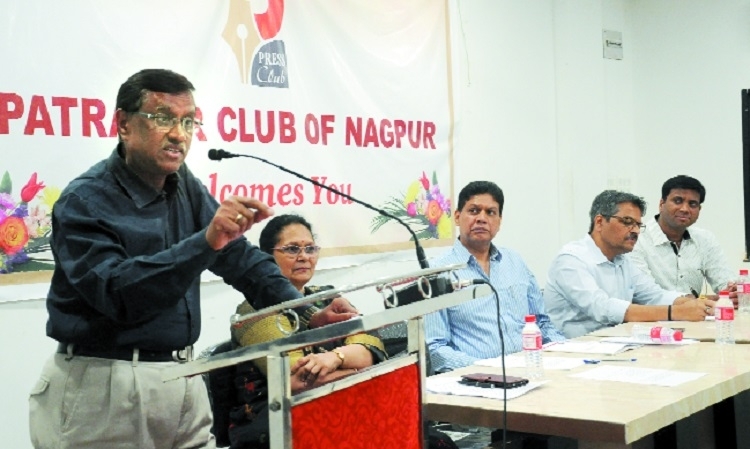 Orderly development requires a holistic approach.” Dr Dnyaneshwar Mulay, former Secretary of Ministry of Economic Affairs, was talking on the topic ‘India out of India - Transition in last 35 years’, at Patrakar Club of Nagpur on Saturday. The programme was organised by Vidarbha Economic Development Council (VED). “If we talk of our country, there is a mad rush for economic development. ‘Make in India’ is a good initiative. But, to make it a great success, every citizen has to be innovative. Our leaders and social reformers have to think differently and take into consideration all the problems and issues people are facing in society. Every possible issue has to be taken up starting from the time of Mahatma Phule, Dr Babasaheb Ambedkar upto Prime Minister Narendra Modi’s era. Indianisation has to be combined with a holistic approach. How to ensure holistic growth of nation is the question leaders have to solve. A rise in GDP is good for the country, but it tells little about the concentration of wealth and why people are living in poverty,” he pointed out. “Today, the world has become a big family. Everyone in the world are in some way connected to each other. There are more people using Facebook than the population of China. All the people have become world citizens. Leaders have failed to understand how this world is working and how people are connected to the world. People will have to re-think about social and economic development. The bureaucracy has to be more innovative. Rules and regulations have to be changed to suit people’s needs. India has the capacity to create a new vision and tell the world about a new development model,” Mulay said. Apart from this, Dr Mulay is known as the Passport Man of India. During his stint he has opened 510 passport offices across the country. Under his guidance, the number of passport holders increased from 6 crore to 9 crore. According to him, passport is the only document which provides an opportunity to progress and mobility. Stamp of President of India on the passport has great importance. It has the potential for a person to be treated as equally as the President of India would be treated. Present were Vilas Kale, Past President of VED, Devendra Parekh, President of VED, Shivkumar Rao, Vice-President. Yogita Kasture moderated the programme. Shivkumar Rao, Vice-President of VED proposed the vote of thanks. Rahul Upganlwar, Secretary of VED was also present.